Grades 1 and up. Thereâ€™ll be no stone left unturned in this challenging strategy game. Inspired by Incan architecture, RUMIS (meaning â€œstonesâ€�) sharpens spatial awareness and critical thinking skills as players strategize to outwit their opponents while reconstructing historical Incan structures (pyramid, tower, stairs, and wall). Each player receives eleven Rumis stones of one color. Players begin, one stone at a time, strategically placing their stones to prevent opponents from having the most visible colored stones. The player with the most stones visible from above wins! 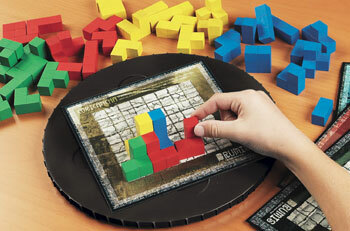 Rumis comes with four beautifully designed game boards, a unique custom turntable, 44 plastic Rumis â€œstones,â€� and instructions for variations on the game, including a habit-forming version of solitaire. I like games that have a real 3D dimension to them - where the third dimension actually matters for the gameplay. In Rumis, this is very much so, since you are placing pieces into physical structure with height. It is part puzzle and part game, and as long as you can handle thinking in 3 dimensions, it is also challenging and great fun. And it comes with multiple setups to increase the longevity of the game. I once played a 3D version of Tetris on the computer, and this is what Rumis reminds me of. It feels mostly like a puzzle and can also be played alone. I've tried both Rumis and other shape-based puzzle games with my children, and this is definately everyone's favorite - probably because of the intricate models you get to build.